to see if they were still relevant in today’s motorcycle market place. One year on, and the Superbike sector exploded in a rush of activity and development. Sportbikes are back on the menu, and we can’t get enough of them! That’s why for 2015 we decided to take AUSTest back to the track, placing the focus on outright performance. These are production race bikes after all, and it’s their racing credentials that still often make the difference in winning our hearts and dollars. To see the full test of the latest 1000cc four-cylinder Superbikes, including guest test riders Craig Coxhell, Cameron Donald and Shannon Johnson, grab a copy of AMCN next week from 1 October. Next issue is our sportsbike special, including the results of AUSTest. While we are still in the process of evaluating all the bikes, assessing their strengths and weaknesses we thought it would be a good time to look back at past standouts and high achievers. In 2014, AUSTest focused on real-world appeal and suitability. This included practicality, value for money, relevance and function of technology, and relative performance. And it was the Daytona that took top honours. 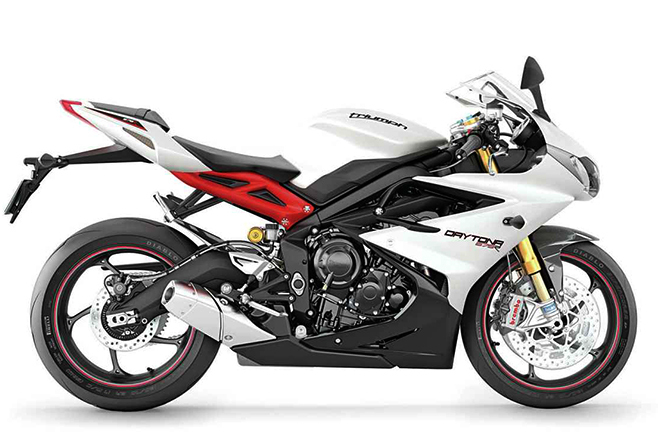 The AUSTest 2014 winning Triumph Daytona 675R is one of those bikes that falls somewhere in the middle, and is helped over the line by offering incredible value for money. Much of the added value is a careful exercise in boutique brand engineering, with Brembo and Öhlins appearing as the eye candy. But this café carpark credibility alone wouldn’t be enough to dazzle our test riders if the bike didn’t excel as a motorcycle for real-world riding. AUSTest 2013 split the field into categories: up to $20K, $20-27K and over $27K. 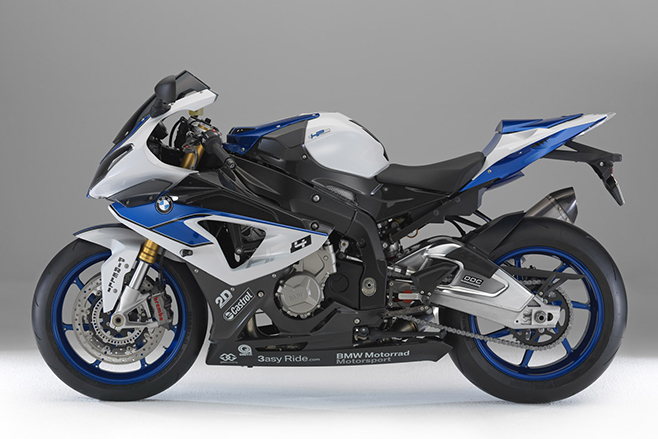 In the first group, the Honda CBR1000RR was the winner, in the mid-price bracket, the BMW S1000RR finished first, but it was the winner of the last category – the BMW HP4 –that took the gong overall. Near on 190 rear-wheel horsepower is an amazing figure for something with an ignition key, and BMW is gutsy for giving us a bike like that. It can do that, without making it an unrideable mess of torched tyres and stressed rider. The electronic suite is one reason, but this bike is more than that, with a sweet power curve (even if revving it that last 2000rpm took some guts for the testers without an Aussie title) and a razor-sharp chassis making it a real weapon. The DVV semi-active suspension also makes it versatile, incredibly so, and this is where it clinched the title over its admittedly sexier rivals. The then recently renamed Sydney Motorsport Park was the venue for AUSTest 2012, and nine bikes were involved. It had been a big year for sportsbike development, so expectations were high. In the end it came down to three: the BMW S1000RR, the Aprilia RSV4 and the Ducati Panigale 1199S. But it was the S1000RR that won the most plaudits. Riders raved about the top-end mumbo and the improved midrange torque, the lighter and smoother quickshifter and the overall user-friendliness of the electronics. The BMW was still a ferocious superbike, but it’s an easy bike to ride when all’s said and done. 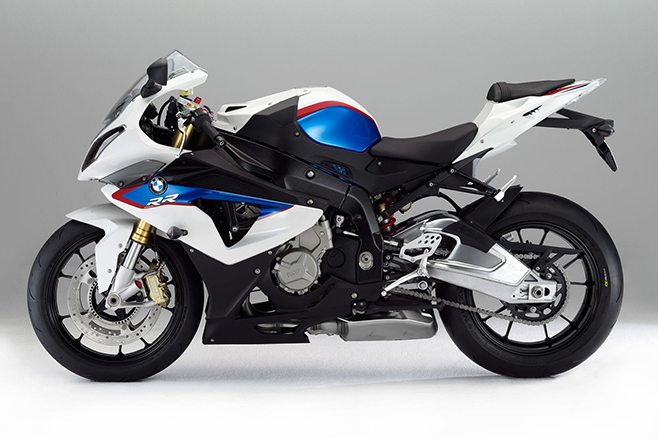 The combination of price [and] track application made the 2012 BMW S1000RR very hard to beat in the overall ratings. 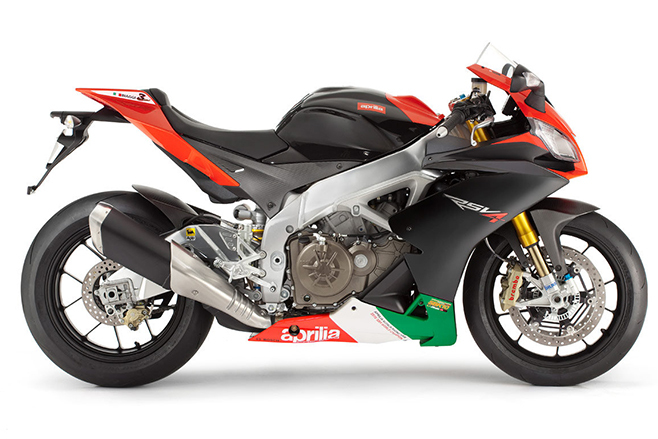 In 2010 the RSV4 had finished runner-up to the BMW S1000RR and the Suzuki GSX-R1000, but it was to be Aprilia’s year in 2011. Over three days of riding through wind, snow (true!) rain, hail and sunshine on the road, eight bikes were put through the wringer and the RSV4 narrowly came out on top. As predicted the race came down to the BMW [S1000RR], Ducati [1198 SP] and Aprilia. It’s no co-incidence these are the most expensive bikes here, but we are talking outright performance, road tractability and comfort, electronic aids, power, handling, as well as value for money in an effort to decide the winner. After coming so close last year, the Aprilia, courtesy of its superior handling and electronics package, has taken the top spot and raised the bar for everyone else. AMCN Vol 65 No 07 – the AUSTest Issue – goes on sale from 1 October.